This small hand painted book page depicts the city of Potosí with the looming Cerro Rico in the background. The mountain housed Potosí’s famous silver mines, which is the subject of the short annotation under the painting. 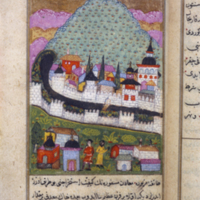 This image comes from a manuscript about the Americas created in Ottoman Turkey in the late 16th or early 17th century. The painter of this scene never saw Potosí in person, and the buildings are imaginary constructions. And the writer of the text described neither Potosí nor any specific feature of the painted scene, but rather methods for extracting silver ore. The image thus shows us how the Cerro Rico (Rich Hill), so named because of its lucrative silver mines, was imagined from a far-away vantage. From the hill, silver came into Potosí to be processed. It was then sent onto Lima and the wider world. In this image, the hill appears imaginatively dotted with plants and unmarked by the mining industry. As seen here, an elaborate system of dams yielded the water used to power the refineries. Spaniards, Creoles, Africans, African Americans and indigenous people from many communities lived and worked in Potosí. In this image, two figures of differing skin color appear in the foreground, but their identities are not known. Neither the patron of this book, nor the painter of this scene is known. This particular copy of the Tarih-i Hind-i garbî veya Hadîs-i nev, is one of several known today. And the painting, while distinct, finds parallels in style and composition with the other versions. The painter worked with colored paints, black ink and gold leaf on paper. Neither the painter of this scene, nor the author of the Tarih-i Hind-i garbî veya Hadîs-i nev traveled to Spanish America. Their work thus represents an interpretation based upon sources published in, and circulating widely through, Europe in the late 16th century, including both Spanish and Italian descriptions of the Americas. This Ottoman book about the Americas was first created as a manuscript in the late 16th or early 17th century. Because its topic was the little-known Americas, Tarih-i Hind-i garbî veya Hadîs-i nev was of such interest that other manuscript copies were made of this original. One such copy, seen here, is currently in the Newberry Library in Chicago, Illinois. Most of the other hand-painted copies, of which fewer than 15 are known, are in Turkey. When the book was published in 1730, the production of time-consuming hand copies largely ceased. Only one of the paintings in this version of the Tarih-i Hind-i garbî veya Hadîs-i nev represents a city in Spanish America. 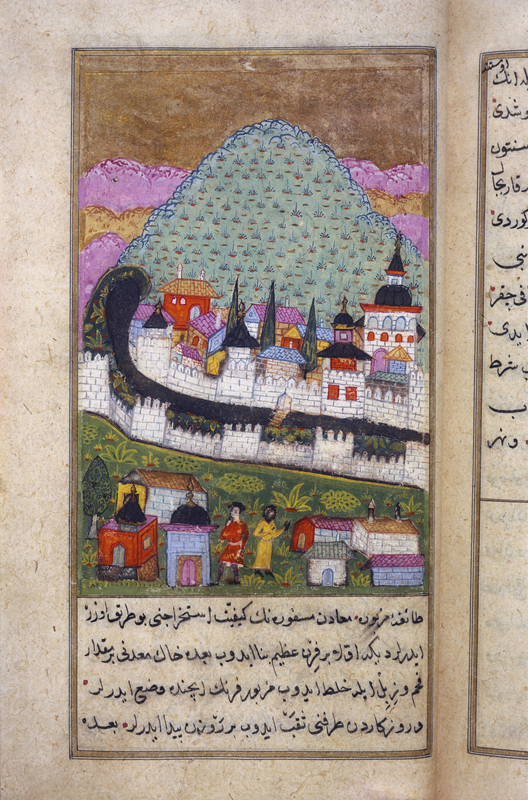 In featuring Potosí, the Ottoman manuscript both reaffirms the silver town’s reputation, and helps to spread its fame among Muslim readers in the Ottoman Empire. Since this work was drawn from Spanish and Italian sources, it also suggests how information about the Americas crossed religious, political and linguistic boundaries. No less importantly, the painting and book betray the desires of Muslim readers to learn about the Americas. Goodrich, Thomas. 1990. The Ottoman Turks and the New World: a study of the Tarih-I Hind-I garbi and sixteenth-century Ottoman Americana. Wiesbaden: O. Harrassowitz. Tarih-I Hind-I garbi, veya, Hadis-I nev: a History of the Discovery of America. 1987. Istanbul: Historical Research Foundation, Istanbul Research Center.